This is fantastic news for those with athletic ability or skill with weapons. 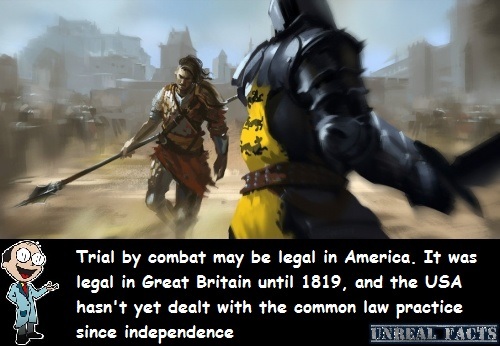 It appears as though, through a unique set of circumstances, that trial by combat may still be legal in America. This is not a weird claim like those that say that dueling is permitted in certain countries, this is a real, but untested law. It’s something that I’ve heard of, but for obvious reasons, never witnessed in real life. Sure, television and movies make use of this ancient law in which a persons guilt or innocence is proven by how well they can fight against another champion, but entertainment and real life don’t always correspond with one another. I mean if it did, every time I cleaned my pool a harem of beautiful young women would throw themselves lustfully upon me, and I know that that NEVER happens. However, this time Hollywood got it right, and trial by combat was a real thing, used for centuries to settle legal disputes in which there was no witness. It was in essence a legally recognized and endorsed duel. The problem is that sometimes the guilty person could win the fight, and be set free. As time relentlessly progressed, and we became less brutal, trial by combat became a less often used method of resolution. By the 1600 this method of resolution to legal matters had ceased throughout Great Britain, with one such event being prevented from taking place by Charles I. In 1819 the British parliament abolished this practice altogether, which ironically ties in with why trial by combat may still be legal in America. But even though it was outlawed in 1819, it didn’t stop one fool from testing its validity in 2002 to avoid some small fines. The court threw out his case, and fined him some more, presumably for being stupid. How can trial by combat be legal in America? So we know that the British dumped this brutality in 1819, so how is it that trial by combat can still be legal in America? Well, thank the Declaration of Independence. When the 13 colonies declared independence from Great Britain in 1776, all the English common laws that were in effect at the time remained in effect, and entrenched in the US legal system. Because the practice was abolished in Great Britain in 1819, which was 43 years after independence, and no US court has had to deal with such an issue, it remains a viable alternative to settle a civil action lawsuit, at least in theory. So if you are strong, athletic, handy with a weapon, fully confident in yourself and your abilities, and you find yourself in trouble with the law, test this out. The worst they can say is no, and make you stand trial anyway.